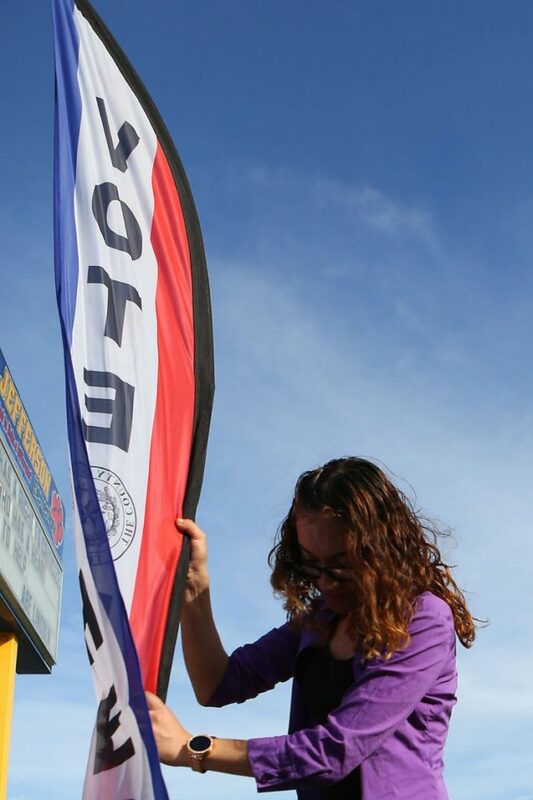 Brenda Escalante Gauna, Hidalgo County elections administration election surveyor technician, plants a flag in front of a polling place at Jefferson Elementary School Monday, Nov. 5, 2018, in Edinburg, in anticipation of Tuesday's midterm elections. Hidalgo County residents will have one more opportunity to vote on Election Day Tuesday, and while turnout has more than doubled since the previous midterm election, there’s still some catching up to do. About a third of the county’s registered voters have already cast their ballots during the early voting period, but most of the other larger counties have had better turnout percentage wise. U.S. Congressman Vicente Gonzalez, D-McAllen, urged those who haven’t voted to take a trip to the polls. In Hidalgo County, voters can cast their ballots at any of the 74 locations throughout the county. One of the most hotly contested races on the ballot is the bid for U.S. Senate with U.S. Rep. Beto O’Rourke challenging incumbent Ted Cruz. The race has caught national attention and has been described as a nailbiter. Both made stops along the Rio Grande Valley on their campaign tours. Locally, residents will choose who will lead Hidalgo County: Democratic nominee Richard Cortez or Republican candidate Jane Cross. The winner will replace outgoing Hidalgo County Judge Ramon Garcia, who is currently finishing his third term. Tuesday’s winner will begin their tenure in January. County residents will also decide whether to invest $190 million in drainage improvements across the county. If approved, the bond would lead to a 3-cent tax rate increase for the Hidalgo County Drainage District. The measure was proposed after a string of storms caused catastrophic flooding in some areas in June. Edinburg residents will decide whether to change the city’s charter and whether Edinburg should borrow up to $30 million for drainage and roadway improvements. Voters there will also weigh in on the local school board race, which has four seats up for grabs. For a list of all local races, go to www.hidalgocounty.us/105/Elections-Department. For a list of local polling locations, including in Starr County, see Tuesday’s print edition.